Stockton was appointed to committees supporting the war effort. He was dispatched on a fact finding tour to the northern army. New Jersey was overrun by the British in November of ’76, when he was returning from the mission. He managed to move his family to safety, but was captured and imprisoned by the British. He was not released until several years later, badly treated and in very poor condition. He lost all of his extensive library, writings, and all of his property during the British invasion. 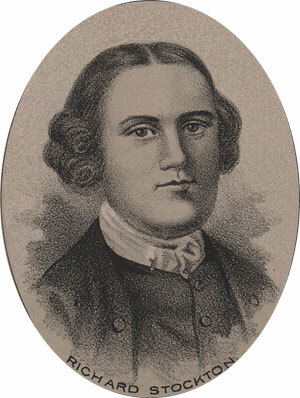 He died a pauper in Princeton at the age of 51.